Diabetes mellitus is a metabolic disorder that tends to be recognized through high levels of blood sugar and other physical manifestations, and it differs significantly from a typical illness or chronic disease. There are several types of diabetes known to the medical community, and all are caused by a variety of different things - in fact, current research in the medical community tends to discover new potential causes of diabetes each year. Ultimately, diabetes is brought on by an individual's pancreas becoming unable to produce the necessary amount of insulin to prevent the development of hyperglycemia. Once a person has developed type 1 or type 2 diabetes, it is incurable - but it is treatable. 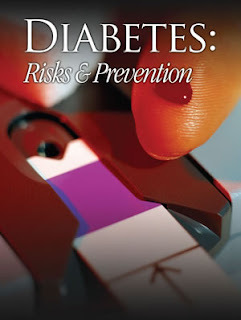 If the diabetes is not controlled through medical treatment, it can lead to life-threatening complications, such as a higher risk of heart failure, blindness, severe nerve damage, and foot wounds that could lead to amputation. Type 1 diabetes differs from type 2 in that it is more commonly found in men, and it may have a small genetic link. This type of diabetes tends to develop when the cells inside of one's pancreas are attacked by the immune system, disallowing the pancreas to produce the required amount of insulin and thereby causing an insulin deficiency. It is also possible to develop type 1 diabetes through after-complications of viral infections contracted during one's childhood or youth. These may take a toll on the immune system, causing it to malfunction later in one's life. Type 2 diabetes has a much larger genetic link, generally resulting from a predisposition toward the disease and lifestyle choices that cause the disease to develop. Parents may pass this disease on to their children at birth, though it is possible to reduce the risk of ever developing type 2 diabetes: this involves wise choices when it comes to lifestyle habits and diet, such as reducing or eliminating the consumption of high-fat foods and excessive alcohol, keeping active, and being careful to avoid becoming overweight. It is possible for type 2 diabetes to become onset with age, regardless of previous lifestyle choices, simply due to genetics. Risk for genetically onset diabetes tends to increase at around 45 years old, and after 65 the risk becomes even greater. In addition, there are certain ethnic groups whose genetic predisposition toward developing type 2 diabetes is much higher. These groups include African Americans, Hispanic Americans, Native Americans, and Japanese Americans. Individuals belonging to these ethnic groups would do well to take extra care when it comes to diet and lifestyle, in order to ensure a long and happy life. Members of your diabetes care team — doctor, diabetes nurse educator and dietitian, for example — will help you learn the basics of diabetes care and offer support and encouragement along the way. But it's up to you to manage your condition. After all, no one has a greater stake in your health than you. Learn all you can about diabetes. Make healthy eating and physical activity part of your daily routine. Maintain a healthy weight. Monitor your blood sugar level, and follow your doctor's instructions for keeping your blood sugar level within your target range. Don't be afraid to ask your diabetes treatment team for help when you need it. Your regular diabetes checkups aren't meant to replace yearly physicals or routine eye exams. During the physical, your doctor will look for any diabetes-related complications — including signs of kidney damage, nerve damage and heart disease — as well as screen for other medical problems. Your eye care specialist will check for signs of retinal damage, cataracts and glaucoma. Flu vaccine. A yearly flu vaccine can help you stay healthy during flu season, as well as prevent serious complications from the flu. Other vaccines. Stay up to date with your tetanus shot and its 10-year boosters, and ask your doctor about the hepatitis B vaccine. Depending on the circumstances, your doctor may recommend other vaccines as well. Whether you feel you have nice feet or not, your feet are an important part of your life. My grandmother used to tell me that my feet were my foundation. As you know, if the foundation cracks or collapses the whole building is in trouble. I have calloused feet and decided recently it would be nice to try having a pedicure. I had never had one before and now I can say I have had three. With the first pedicure my feet looked great and I enjoyed the experience. With the second, the manicurist cut the skin on the side of my big toe and it became infected. Being vain and enjoying the looks of having pretty coral painted toenails when I wear my sandals, I tried another pedicure and the manicurist clipped my skin again and drew blood. If you have diabetes, this is not a good thing. What's a person to do? At my previous employment as a diabetes educator, we instructed our patients to never get a pedicure. Realistically, I don't know how many people follow this advice. Here are some recommendations for individuals who decide to go ahead and have a pedicure. 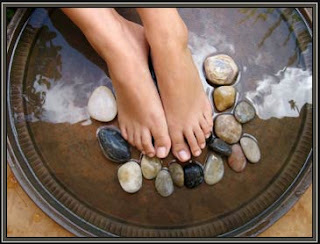 This was taken from an article about pedicures in the "Diabetes Forecast" October 2008 issue. Use good judgment. Be picky about the salon. Check out several salons and look into sanitation practices and how they clean their tools. At one local salon in our area, you buy your own tools and they are kept in a box with your name. Inspect the foot tub. Does it get cleaned between clients? Inspect the tools. Stainless steel instruments are more sanitary than wooden sticks. Don't be afraid to give the nail technician instructions. Let them know you have diabetes. Water temperature of 90-95 degrees should be safe, avoid razors, no lotion between the toes, and be gentle. If you shave your legs, stop 2 days before the appointment to decrease your chances of bacteria entering nicks or cuts. What is a Dibetic diet? Have you or a loved one recently been diagnosed with diabetes? Not to long ago this could have been considered a tragedy. This is because the diagnosed diabetes patient would lose out on all the good tasty food and end up stuck on so many restrictions. But, in this day and age neither is strictly as true as their past counter parts. Now, the diabetes diet actually helps an individual to want to live a healthy life and this includes the great plan called diabetes diet. Yes, diabetes does still need to be moderately monitored throughout an individual’s day. This includes watching their food intake and checking there available blood and glucose levels. If diabetes is not controlled right, it can still be a disaster to many of your body’s natural systems. While it is true that diabetes or more manageable than ever, it’s still a good idea to keep a close watch on all your consumed foods. There are so many free diabetes diets available offered through either registered dieticians or even a reputable internet website. The greatest difference with today’s diabetes is you actually get to enjoy flavor once again. You will never be condemned to a flavorless world ever again. This is especially true when we live in the 21st century. The great choices that are available will help you greatly throughout your life. Each individual is different and there for the diabetes diet must differ as well. You will be assigned with six different food categories to start off with. Many commonly consumed foods have been added to this diet. To the surprise of many, fast food items have also been added over the last decade. This will ensure your choices and freedom when trying to live a healthy diabetic lifestyle. Don’t be afraid to ask your doctors questions, this is important to get the whole round-about feel of what it’s going to be like diagnosed with diabetes. Many different sourced have created their own diabetes plan. This is important to know because doing research on them will surely lead you to the best fit for you. Always use common sense when reviewing your plan. This is easily done by leaving a plan when you notice any red flags that could harm you even further. Miracle cures and diets just don’t exist, but a good well thought out plan could help you prosper with the use of a diabetes diet.